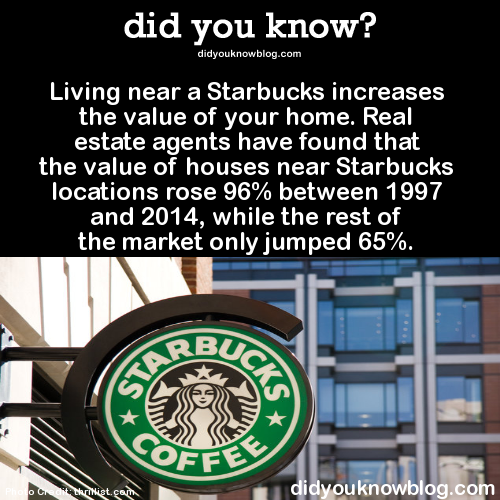 Between 1997 and 2014, homes within a quarter-mile of a Starbucks increased in value by 96 percent, on average, compared with 65 percent for all U.S. homes, based on a comparison of Zillow Home Value Index data with a database of Starbucks locations. Some areas brew even frothier returns, as Julie Lerch can attest. A little over a year after she moved in, a Starbucks opened less than two blocks from her Chicago condo. Three years later, she sold the 2-bedroom unit for $100,000 — or 53 percent — more than she paid for it. Lest you think all java purveyors have the same effect, the data showed that homes near Dunkin’ Donuts locations appreciated 80 percent, on average, during the same 17-year period. ... excerpted from an article posted on the Zillow blog. A study in cause and effect. Did Starbucks move into a neighborhood cause the gentrification, or did Starbucks see the trend and jump on it? You ask hard questions vanilla. I guess having one within walking distance would be nice. I seldom if ever stop at Starbucks. Actually when my internet is down is when I show up at one! That's pretty interesting information. Simplicity | the ultimate sophistication.